New York City, February 08—Athing Mu (Central, Trenton, New Jersey) gave the HS Record in the 600 a scare to highlight prep competition at the Millrose Games. The versatile junior clocked 1:27.36 to improve her hold on the No. 2 spot on the all-time list, winning by more than 3 seconds. 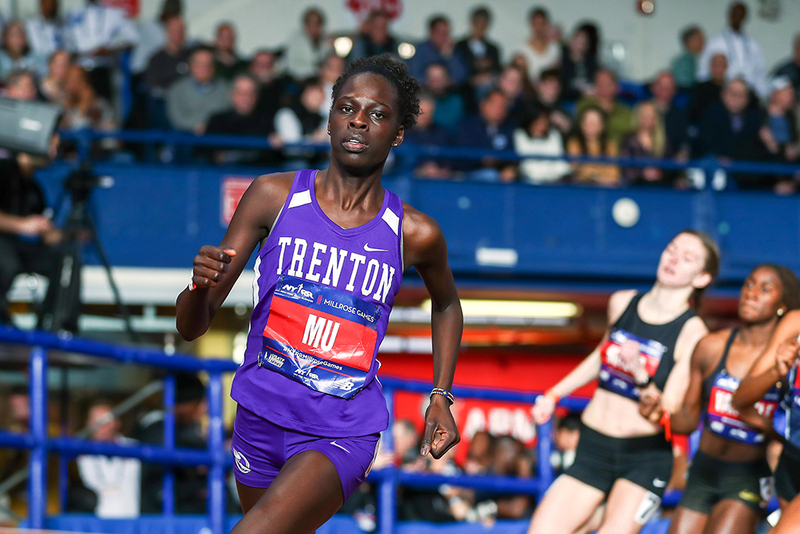 After posting a swift 1:28.54 in January, Mu had her sights on Sammy Watson’s 1:27.13 HSR from ’17 and came to the Armory with a plan for an aggressive pace. She went out in 27.02 and 57.30 before finishing up with a strong 30.06 circuit. “I’m pretty satisfied with the race,” she said. 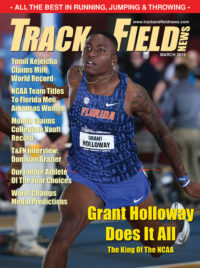 “I can’t really be mad at it, because it’s still a PR and a junior-class record.” The reigning New Balance 800 champion indoors and out, Mu tops the yearly lists in the 400, 600, 800 and 1000 and expects to race against the pros at the USATF Championships, though she hasn’t decided on which event. The premeet headline attraction, Katelyn Tuohy (North Rockland, Thiells, New York), scratched from the mile with an unnamed illness, but the race still produced a meet record as Marlee Starliper (Northern, Dillsburgh, Pennsylvania) went wire-to-wire for a 4:41.66 clocking to move to No. 11 on the all-time list. Versatile Taylor Ewert (Beavercreek, Ohio) broke her own national record in the mile walk, clocking 6:28.21 to win the open race, which doubled as the USATF Championship. Her previous best was 6:45.68. Her en route 6:02.85 also broke her own 1500 record. Her day wasn’t over, though, as she doubled back six hours later to run the mile, finishing 6th in a PR 4:51.97. Britton Wilson (Godwin, Henrico, Virginia) moved to No. 3 on the all-time 300 list with a 37.53 clocking and Matt Rizzo (Bronxville, NY) came out on top in a tight finish in the boys mile, clocking 4:09.12. Jack Renfree (Catholic, Knoxville, Tennessee), Sean Dolan (Hopewell Valley Central, Pennington, New Jersey) and Sam Affolder (Loudoun Valley, Purcellville, Virginia) all came home under 4:10. Yearly list-leading times came in both 4x8s, with St. Benedict’s (Newark, New Jersey) winning the boys race in 7:43.68 and Union Catholic (Scotch Plains, New Jersey) taking the girls title in 9:07.44. 2. *Ryan Willie (Bullis) 33.89; 3. *Rashaun Stewart (Columbus, Bronx) 34.02. 600: 1. Luis Peralta’ (Passaic, NJ) 1:19.29; 2. Alfred Chawonza’ (St Benedict’s, Newark) 1:19.61. 5. Carter Cheeseman (Christian, Ft Worth, Tx) 4:12.85; 6. Alex Rizzo (Bronxville) 4:12.89. 4 x 400: 1. Columbus 3:19.39. 2. Loudoun Valley, Purcellville, Va 7:52.78; 3. West Springfield, Springfield, Va 7:53.49; 4. Arlington, NY 7:53.66. PV: 1. Haze Farmer (Lake Hamilton, Pearcy, Ar) 17-2¾; 2. *Rhett Nelson (Trinity, Texarkana, Ar) 17-2¾. TJ: 1. Mason Henry (Glen Allen, Va) 49-8½; 2. *Jadan Hanson (Uniondale) 49-1¾. Wt(2/07): 1. *Kyle Moison (Lincoln, RI) 71-¼; 2. Jacob Furland (Classical, Providence) 69-11¾. 60: 1. ***Moforehan Abinusawa (Germantown, Ft Washington, Pa) 7.33. Open 60: 7. Thelma Davies (Girard, Philadelphia) 7.45. 4. *Hannah Waller (South Lakes, Reston, Va) 38.89; 5. *Leah Phillips (Bullis, Potomac, Md) 39.00. 2. *Victoria Vanriele (Livingston, Berkeley Heights, NJ) 1:30.64; 3. Vanessa Watson (Spencerport, NY) 1:30.84; 4. Lindsey Butler (Corning-Painted Post, Corning, NY) 1:31.51; 5. **Makayla Paige (Memorial, Tewksbury, Ma) 1:32.58. 4. Lily Flynn (Ursuline, New Rochelle) 4:48.02; 5. *Isabelle Goldstein (Germantown, Ft Washington, Pa) 4:49.20; 6. *Taylor Ewert (Beavercreek, Oh) 4:51.97. 2. Robeson, Brooklyn 1:37.91; 3. South County, Lorton, Va 1:39.34. 2. Mt De Sales, Catonsville, Md 9:07.87 (***Juliette Whitaker 2:08.96); 3. Neumann & Goretti, Philadelphia, Pa 9:09.06. PV: 1. Edie Murray (Lake Hamilton, Pearcy, Ar) 13-5¼; 2. Gennifer Hirata (Stafford, Fredericksburg, Va) 13-3½.